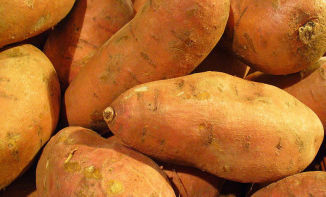 Sweet potatoes are an excellent source of vitamin A and vitamin C and a good source of fiber, vitamin B6, and potassium. Vitamin A is a fat-soluble vitamin that helps maintain good vision, protects the body from infections, supports cell growth, and keeps skin healthy. Sweet potatoes are one of the richest plant sources of beta carotene, which the body converts into vitamin A. Antioxidants, like carotenoids, help keep the immune system healthy.